My Dodgson family tree has been traced back to Benjamin Dodgson who was born in Yorkshire, England in 1796. The 1841 census shows Benjamin as living in Tadcaster, Aberford. Benjamin married Elizabeth Arnold who was born in 1795. The 1851 census of Yorkshire shows Elizabeth living with her children, mother and niece Eliza Arnold who was 12 and was born in Womersley. Elizabeth is listed as a widow, meaning that Benjamin died before the 1851 census was taken. Her occupation was listed as a labourers wife. Benjamin and Elizabeth had 7 children, Teresa (born 1835), John (born 1837), Frank (born 1837), Benjamin (born 1841), Amey (born 1843), Arnold (born 1840) and George (born 1850). My Dodgson family are ancestors are the offspring of George Dodgson and his wife Jane Hall (born 12 August 1854, died 29 February 1908). George and Jane married in Pontefract on the 14th of June 1873. 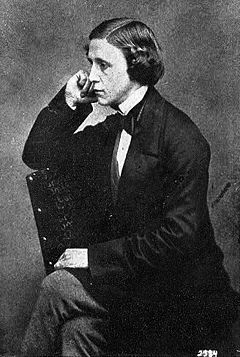 Charles Lutwidge Dodgson (born 27 January 1832, died 14 January 1898), is better known by the pseudonym Lewis Carroll, was an English author, mathematician, logician, Anglican deacon and photographer. His most famous writings are Alice's Adventures in Wonderland and its sequel Through the Looking-Glass, as well as the poems "The Hunting of the Snark" and "Jabberwocky", all examples of the genre of literary nonsense. When Charles was 11, his father was given the living of Croft-on-Tees in North Yorkshire, and the whole family moved to the spacious Rectory. This remained their home for the next twenty-five years. Given the fact that the families lived in Yorkshire at the same time and that Benjamin's family was so big and Charles also came from a large family there could be a link between the two family trees. Any information on the subject would be greatly appreciated.